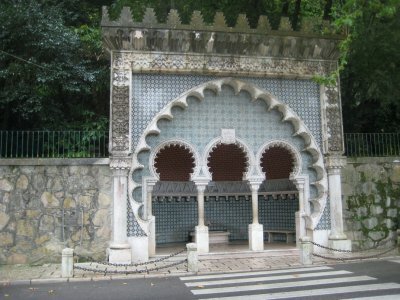 A wander around and wonder at the UNESCO heritage site of Sintra, outpost of both the Arabic and Moorish rulers of Al-Andalus and the plaything of the kings of Portugal built in the Romantic style. View Iberia '09 on GregW's travel map. One wouldn’t expect that you could get on a train at a functional looking train station in Lisbon and wind up less than an hour later in a mountain village that looks pulled from a painting on the cover a fantasy novel. 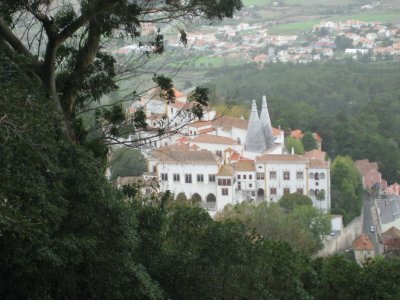 One would be wrong, though, because you can get in less than one hour by train from Lisbon to Sintra. 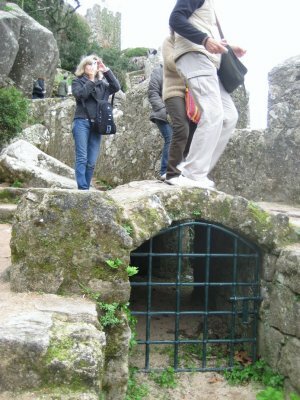 I first heard of Sintra through the writing of a travel blogger going by the handle of “The Longest Way Home.” He wrote of a search for a hidden Knights’ Templar well while in Sintra. 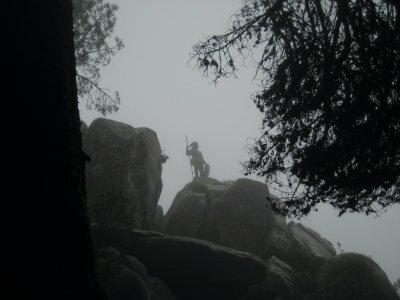 What a magical place, I thought, where one can have adventures reminiscent of Indiana Jones. When heading to Lisbon, I just had to see it for myself. 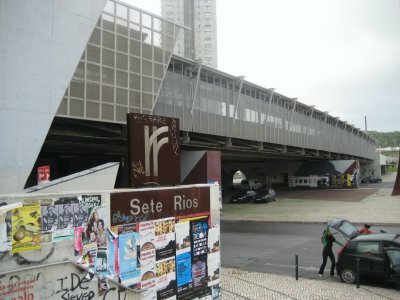 From Lisbon, I headed out from Sete Rios train station, just a 15 minute walk from my hotel. After a 45 minute trip on a comfortable suburban train, I stepped off into a village straight out of a fairy tale. I got hit with the magic right off the train. Just down the street from the train station is the town hall. 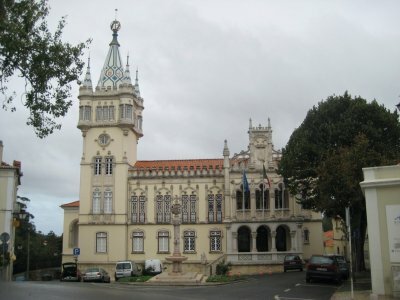 The town hall was designed by architect Adaes Bermudes and built between 1906 and 1909 in “the neo-manueline style.” It is both imposing with it’s large tower, but also quite inviting and open. Unfortunately, in addition to getting hit by magic, I started to get hit by rain. 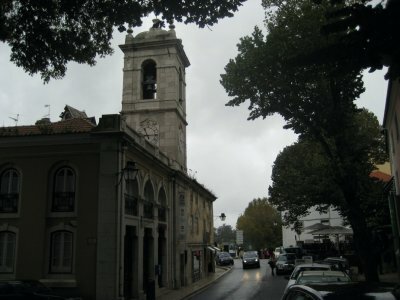 It had been sunny the day before in Lisbon, but the rain had settled in over the area on Sunday. 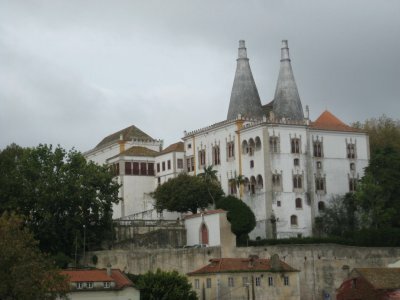 With a train ticket booked out of Lisbon the next day, this was my one day to see Sintra, though, so I decided to brave the rain and see the sites. 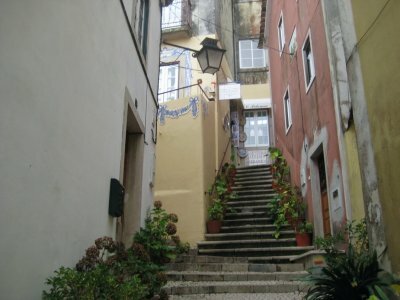 Up from the town hall is the main historic area of the village, anchored by the Royal Palace of Sintra. 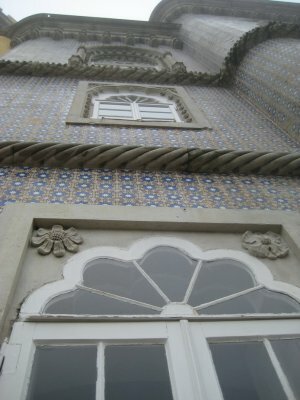 The Palace stands overlooking the centre of Sintra, topped by two large white chimneys. 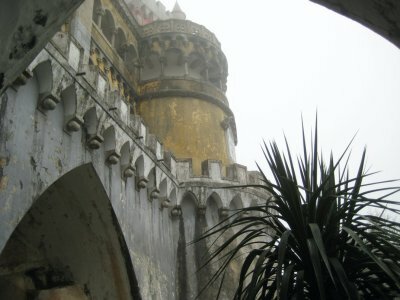 The earliest parts of the palace were built in the 9th century by the wallis, the Moorish governors of Sintra. 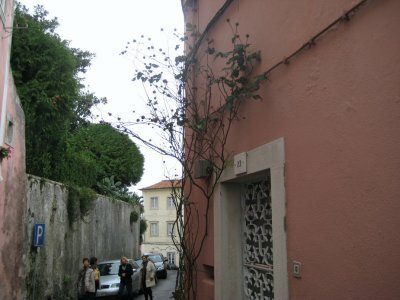 Since then it has been added to, expanded, and renovated to become the building it is today. The rest of the town is as pretty. 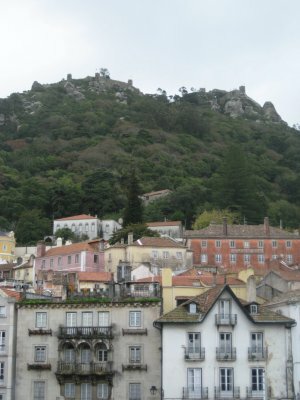 Up in the hills, Sintra has more of an Alpine village feel than a Portuguese sea-side village. Rocky hills covered with evergreen trees rise in all directions around the village. 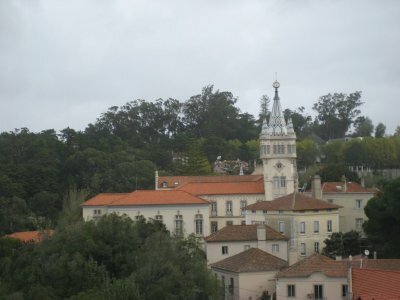 From the village, there are two buildings atop different hills that tower over the village. 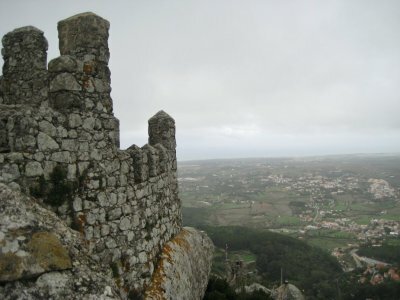 The first one is the Moorish castle. The castle had its beginnings as a military fort, believed to date back to the 9th century and the period of Arab occupation. It served as an excellent observation post for monitoring the coastline for attack, and because of its cliff-top location was hard to attack and easy to defend. It wouldn’t have made a great look out to the sea the day I was there, though. Fog obscured the coast, and the wind meant that even if you could have seen the coast, you would not have been able to stand on the walls for long without being blown over. In the event that you aren’t aware of the history, much of Spain, Portugal and parts of France were ruled by Arab and North African (known as Moors) rulers from the 8th until the 13th century. After Islam rose in power and much of the Middle East and North Africa were converted, rulers of the new Muslim kingdoms sought to expand into Europe. In 711 they expanded into the Iberian peninsula, and expanded their control over the next 50 years. The area of their control was known Al-Andalus. Borders shifted and Kingdoms passed between hands for the next 350 years. In the 1100s, most of Iberia was reclaimed by the Catholics, though the final patch of Muslim rule was not returned to Catholic control until 1492. 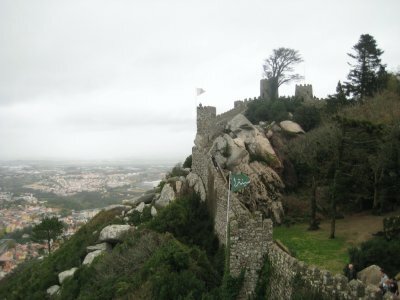 The castle at Sintra was built by the Moorish rulers of Sintra in the 9th and 10th centuries. It was recaptured by the King of Leon in 1093, but captured back quickly by the Moors. 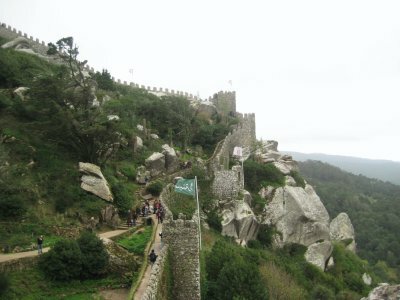 In 1147, the castle was handed over to Afonso Henriques, who became the first king of the newly created Kingdom of Portugal. 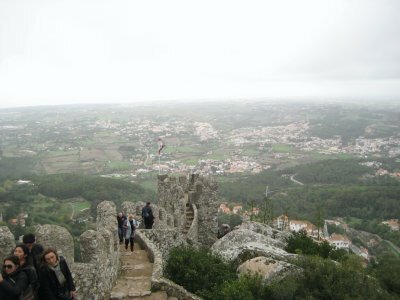 I really liked the Moorish Castle, despite the wind, rain and fog. 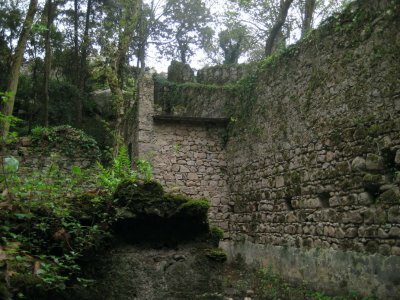 I like ruins. I’d rather see ruins than a completely restored building (even though I know extensive work has been done to keep the castle in the shape it is). Ruins speak to both the age of the building, and also the impermanence of humans and our history. 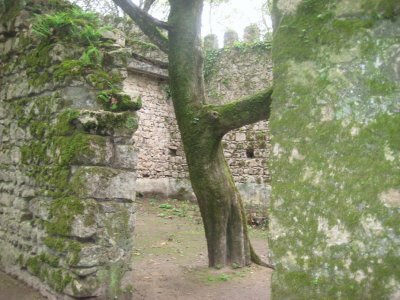 The trees and bushes that sprout up among the tumbled rocks of the walls of the castle lay waste to any claim we humans make about the enduring majesty of our existence. We are just small specks on this big earth, and in 1000s of years it may be the case that no one will even be able to tell we were even here. (Well, actually having read the book “The World Without Us,” I know that it’ll take 7 million years for the faces to erode off Mount Rushmore. But the rest of the stuff we build will disappear pretty quickly without us around to maintain it). Atop another hill (more hiking down and hiking up in Sintra, just like Lisbon. 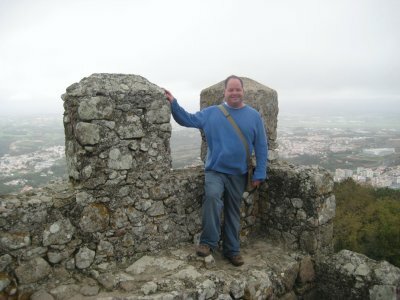 At least I was getting exercise to offset the vacation food and drink), I hiked up to the Pena Palace. 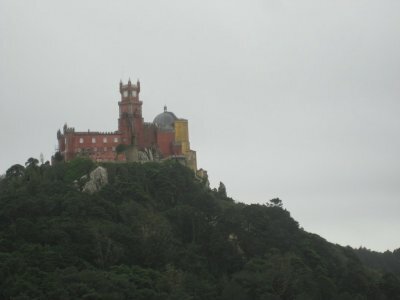 Build in the 1840s and 1850s on the site of an old Monastery, the Pena Palace sits atop another high peak overlooking Sintra. 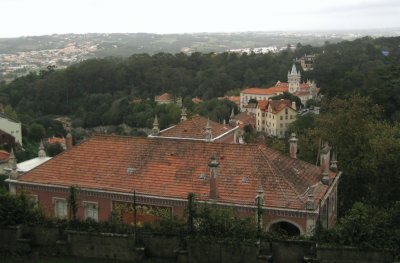 It is the “exuberant creation” (according to the tourist brochure) of Queen Maria II of Portugal and her consort, Fernando of Saxe-Coburg Gotha. 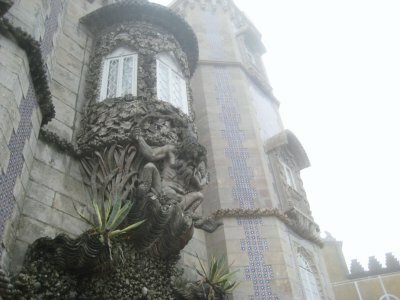 It is the epitome of the Romantic architecture, an ornate and eclectic decorative style. 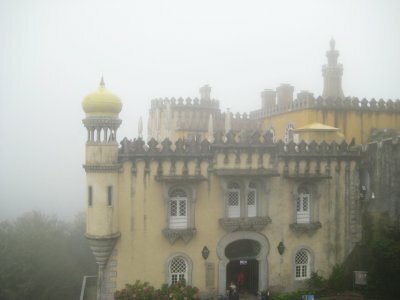 In some places online, I read that Pena Palace described as “Disney-esque.” I can see that. Besides for the bright colours, it is a castle built in the mid-1800s, long after the time for medieval castles had past. It is a mish-mash of styles sporting such disparate touches as Eastern-influenced onion domes, Venetian-inspired towers and medieval battlements. 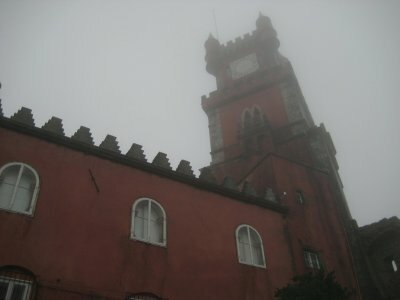 The weather had turned even worse as I reached the Pena Palace. The fog had rolled in and the wind had picked up. The weather was definitely only rolling in from one side, though. 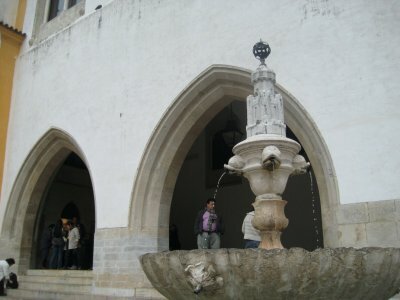 The Palace had two courtyards on either side of the main building. On the lee-side, it was quiet and gray, drizzling but with no wind or fog. 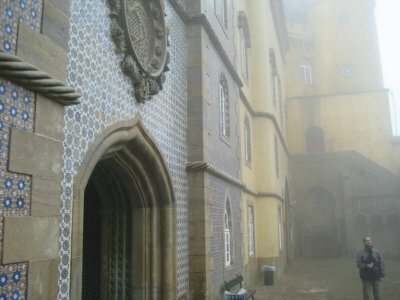 Walk through the gate to the other courtyard though, and and it was foggy and windy, and the light drizzle was pelted by the strong wind into small bullets of water. 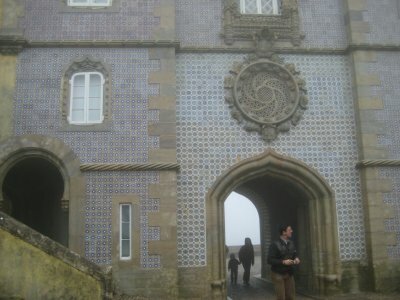 I did not enjoy the Pena Palace as much as the Moorish castle. It felt too “put on” to me. It was a Palace, not a castle. It was purely for show, a chance for the rich and powerful to say, “look at us, aren’t we grand and regal?” Bah, humbug, I say. Perhaps this is my Protestant, working-class heritage showing through, but it just seems a waste of resources on something that is nothing but flourish. King Fernando and Queen Maria did get one thing right, though. 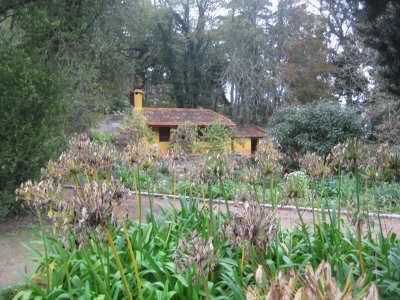 The gardens surrounding the Palace were impressive. 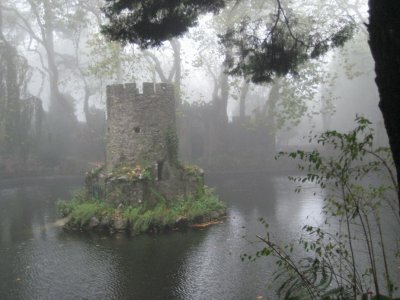 Like the castle, the gardens are a mish-mash as well, built with a trees and plants from around the world. 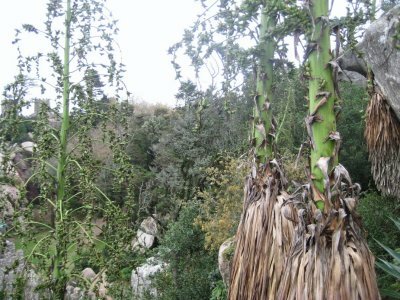 Somehow, despite being on a windy and cool mountain-top in Portugal, they were able to plant flora from around the globe, including from the tropics. Temple of the Columns built in 1840. Small temple serving as a viewpoint over the Palace (though exactly how you can see it through the fog and heavy foliage is beyond me). 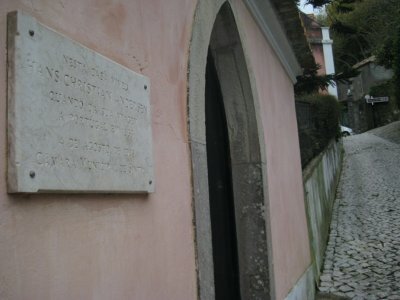 Built on the site of a chapel dedicated to St. Anthony. 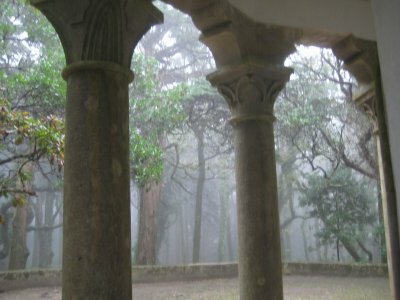 I was going to hike out to the Cruz Alta, the “high cross.” The cross is carved in stone and stands at the highest point in the Sintra hills, at 529m above sea level. The point is also a good place to look out and see the Atlantic Ocean. 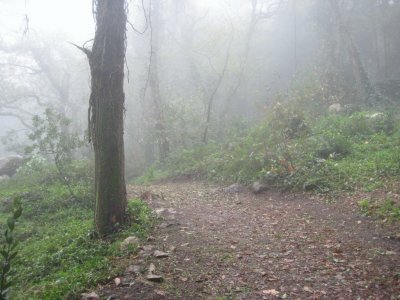 The rain intensified, though, and the fog thickened. My jeans were soaked up to my knees thanks to the wet weather. 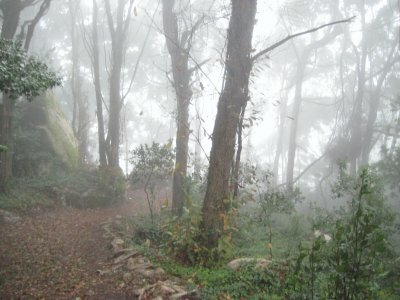 I decided to skip the Cruz Alta, figuring I wouldn’t be able to see anything anyway, and find a nice cafe for a warm cup of tea or cocoa. 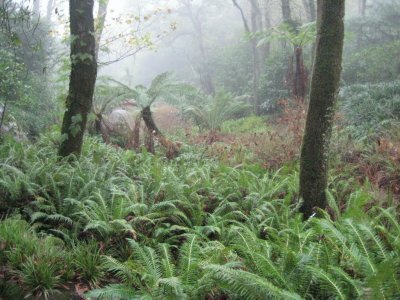 On the walk out of the garden, I was stopped at a junction of a few paths consulting my park map when a couple came up. They were from Belgium, and unsure of how to get out of the park. 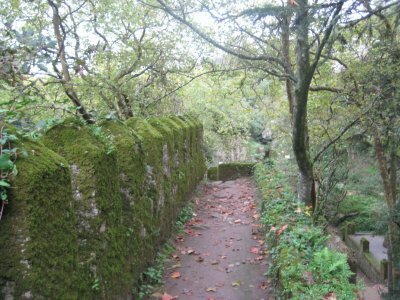 The area surrounding the Palace of Pena is called a garden, but it covers 85 hectares, so getting lost is quite understandable. Luckily, one of the few skills I have is map reading, so I was able to lead them out to the Valley of the Lakes entrance. We walked along and chatted, and it turns out they had just come from the Cruz Alta. They confirmed I had made the right decision - the wind was awful and the fog and rain meant that you couldn’t see a thing. 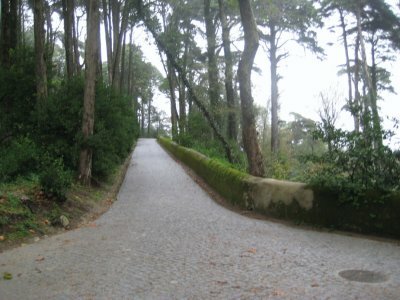 We parted ways at the exit of the park, and I headed back on a forest path to the Moorish castle, where I planned to follow the same path I’d come down to get back to Sintra. 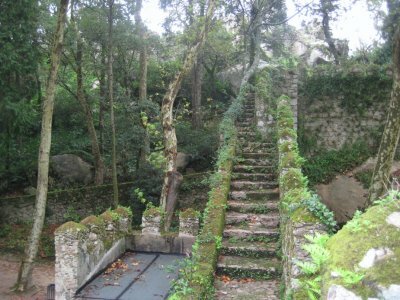 The forest paths ungulate up and down, and to make them easier those who built and maintained the castle and its paths have added stone steps to the steep bits to create stairways. 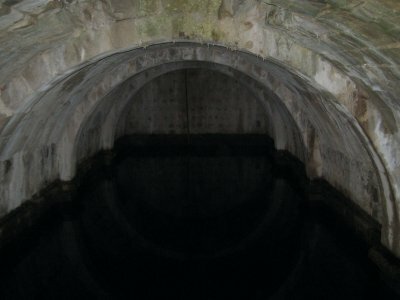 Over the last ten centuries, though, the stones have become smooth and rounded. Add to that the rain that had fallen that day, and the stones became positively slick. In my last entry I mentioned that my shoes were old and didn’t have much tread left. I’ve had the shoes for two years, so it was well past the time to trade them in. I had been meaning to go out and buy new shoes, but kept putting it off because the shoes were fine for walking on dry days on flat, even pavement. Put in a place where they needed more grip though, the worn down soles offered no traction though. Like a racing car driver on slick tires on a wet track, I lost it. I fell hard. A French couple were passing by just then, and they were nice enough to check that I was okay. I was alive and not bleeding, but I didn’t feel great. I’d landed mostly on my back and left arm. My back, where it had hit the stones, was throbbing. There were shoots of pain from my hand as well, and I couldn’t bend my left thumb. 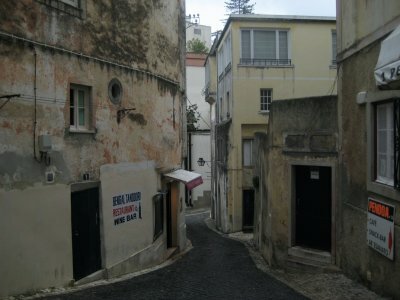 I hobbled back down to Sintra, skipped the hot cocoa and instead went for a numbing beer. I hopped on the next train to Lisbon, returned to my hotel and slipped into a hot bath, hoping to soak the pain away. The back pain was fine the next day, but the thumb is taking longer to recover, though it is recovering. A poor ending to what had been a great day. It’ll be fine though. A few days later I was reading an article about how scientist have determined that we humans actually tend to more positively remember things than they actually occurred. We save the good memories, but throw out the bad ones. Years from now when I look back at this entry, I’ll probably be surprised reading about the thumb sprain. I won’t remember it. 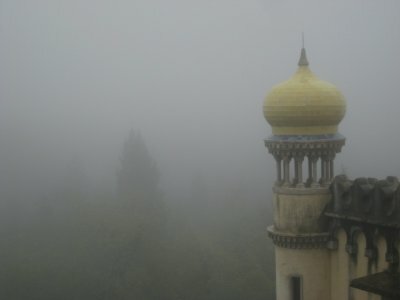 Instead I’ll probably recall the little Alpine-feeling village in the hills outside Lisbon that had a mystical ancient castle blanketed by a magical fog.